Resnais’s second movie in a row about a group of actors rallying around a dying friend. 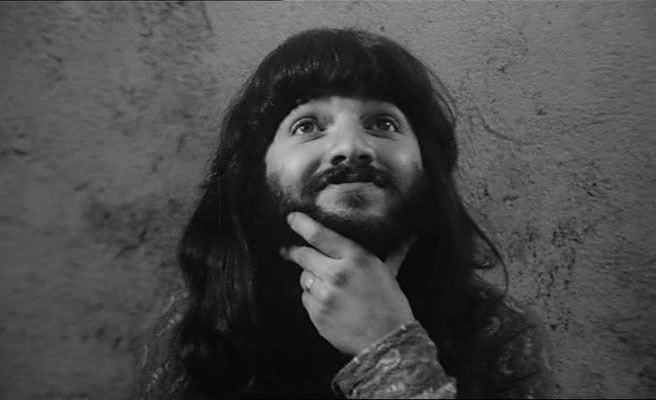 You Ain’t Seen Nothin’ Yet was a perfect final film, but Resnais was still alive and working, so he made another one. It’s just as playful, but more in the story than the filmmaking – this time the never-seen dying friend uses his situation to steal all the women. Actually called Aimer, Boire et Chanter (google: Loving, Drinking and Singing), which is a wonderful title for the final film of one of our greatest directors – but Life of Riley was the title of the Alan Ayckbourn play it adapts. Resnais’s third Alan Ayckbourn adaptation, fourth if you consider Smoking/No Smoking two movies, fourth-and-a-half if you consider the play-within-the-film here is Ayckbourn’s Relatively Speaking. The players: Kathryn (the great Sabine Azéma) and her balding clock-watcher husband Colin (Hippolyte Girardot, Anne Consigny’s husband in A Christmas Tale, ensemble in You Ain’t Seen Nothin’ Yet) live in a comfy row house. The dying man’s wealthy best friend Jack (sideburnsed Michel Vuillermoz of the last two Resnais films) and wife Tamara (Caroline Silhol, young rich guy’s mom in A Girl Cut In Two) live in a nice, big house. The dying man’s ex-wife Monica (Sandrine Kiberlain of Benoît Jacquot’s Seventh Heaven) and her new man, the much older Simeon (André Dussollier in his eighth Resnais film) live at Simeon’s place in the country. George Riley, afflicted with cancer, is never seen or heard, nor is the amateur theater director who casts a few of our characters in Relatively Speaking, which they’re rehearsing throughout the film. Kathryn and Tamara convince a reluctant Monica to move back in with Riley for a few weeks, but all three women start spending too much time at his house, and each is personally invited to go on a final vacation with him after the play closes. Each is tempted: Tamara’s upset that her husband is cheating, Monica was Riley’s wife for years, and Kathryn almost married Riley before meeting Colin. Ultimately Colin and Kathryn’s daughter Tilly sneaks away and joins Riley on the trip, during which he passes away. Almost all the action is set on backyard patios – blatantly artificial, stagey sets (house walls are represented with hanging strips of cloth). Establishing shots are drawings. Closeups are always set against a b/w crosshatch pattern. And there are a couple of appearances by an angry-looking puppet groundhog. Lovely, light music by Mark Snow. Won prizes at Berlin, playing with Boyhood, Beloved Sisters and winner Black Coal, Thin Ice. Colin and Kathryn’s beautiful teenage daughter, who comes to the old seducer’s funeral, is the film’s trump card; her serene indifference to the event is a kind of mirror image to the equally serene god’s-eye perspective with which the movie treats its heroes … The couple’s daughter, on the other hand, speaks the unflappably confident language of a person just starting to live. To say that the movie lacks the terms to interpret this language is only to say that it’s a film made in the spirit of old age rather than that of youth — but few swan songs cede the floor to a younger generation this graciously, or with such mischievous parting words. So, it’s far from the best Resnais film, as most of the reviews I’ve read agree, but as F. Nehme said, “it’s still an affectionate coda for a master,” and that’s nothing to sneeze at. After all, the death of Riley didn’t move me, but the phrase in Richard Brody’s review, “Sabine Azéma — Resnais’s wife, now his widow,” is the saddest I’ve read all month. I watched a collection containing roughly half of the Cinetracts, an anonymously-directed series of two-to-five-minute shorts. The first few seemed to be protest-photo montages, and I thought watching a bunch of these in a row would be tiresome so I spaced it out over a few weeks. Some are very different though, telling stories/poems with intertitles or scrawling words directly onto the photos, using different forms of movement and speeds of editing. Some use zooms and dissolves, bringing the photos to life, others are simply long takes of photos interspersed with titles, wordplay, pages from books. Contributors supposedly included Godard, Marker, Resnais, Gorin, Philippe Garrel (same year he made Le Révélateur), Jackie Raynal (editor on half the Six Moral Tales), Jean-Denis Bonan (Jean Rollin’s editor at the time), Gerard Fromanger and Jacques Loiseleux (later cinematographer for Ivens, Pialat and Yves Boisset). Marker was busy – this project overlapped his SLON collective and Groupe Medvedkine. Gary Elshaw has by far the most useful work on the Cinetracts online, even if it’s only about Godard’s contributions. The purpose of the Ciné-Tracts, as with most of Godard’s 1968 film projects, was to offer a critically alternative source of ‘news’ or information in contrast to the commercially offered mediums available. … The state censorship of the media throughout the events of May necessitated communication along different lines than had existed before. Other online writing on these tends to focus on determining which ones Godard made (and they can’t seem to agree). Info dump by a cynical Frenchman who acted as a UN peacekeeper during one of the Yugoslav wars. He speaks rapidly in close-up, with occasional title cards for different topics and cutaways to a photo album. Watched this again with much improved picture quality and English voiceover. Had been burning to see it again since watching Dan Geva’s Description of a Memory. Still great, but I think I prefer Sunday in Peking. Noticed this time when the voiceover said “bar kokhba,” which is apparently not only the name of a John Zorn music project. Some of the earliest-listed Resnais shorts, a series of short portraits of different artists from the year before his Van Gogh, and three years before Gauguin and Guernica. I was surprised to come across these online. Not sure if they were released with no sound, but the copies I found were completely silent, with no music, no clever Marker or Cayrol or Queneau commentary, so I looked up info on each artist online. Some time-lapse painting, and did I see a stop-motion statue? Groovy looking dissolves in this one. 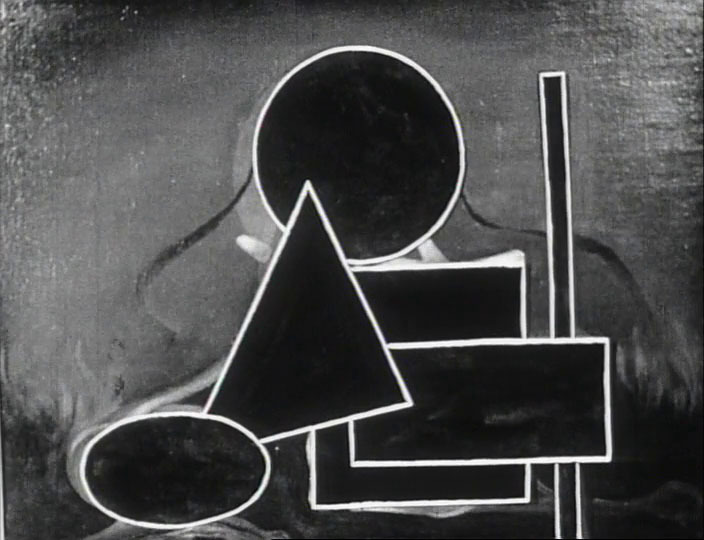 Wiki: “Hans Hartung (1904-1989) was a German-French painter, known for his gestural abstract style.” The nazis tried to arrest him for being too cubist. Aha, an opening credit for commentary by A.F. Delmarle – so these were not originally silent. This one’s in rougher shape. Shows him using cutouts and tapping a paintbrush to get texture, sanding objects which will be affixed to the canvas, then last couple minutes is a showcase of finished(?) works. No commentary credit here, just an opening Hegel quote then a long pan down two mighty collages. Works shown focus on naked women and birds, two of my favorite things, and are super awesome and disturbing, reminding me of Dali-meets-Woodring. Wiki: “Félix Labisse (1905-1982) was a French Surrealist painter, illustrator, and designer.” IMDB says he has cinema experience, appearing in Zero for Conduct and a couple Henri Storck films. Sci-fi landscapes, nudes and angular craziness. With piano music. Nice bit at the end showing her beginning a painting, lighting a candle, then a title card says “at dawn,” the candle has burned down and painting is complete. Askart: “Christine Boomeester (1904-1971) was active/lived in Italy, Netherlands, France, Indonesia … known for abstract paintings.” She was also married to Henri Goetz. The big one, twice as long as the others. The usual slow zooms and pans across the paintings (even a spiraling zoom into one), but also more process exploration, showing progression of the artist over a few years, a series of drawings with each one inspired by details in the previous, and the month-long process of creating a new painting – which is burned at the end (can’t tell if it was a reproduction). All these were “presented by Andre Bazin,” co-founder of Cahiers du Cinema and mentor of the French New Wave, who rarely appeared in any film credits himself. Can’t find evidence that Henri-Georges Clouzot knew Resnais, or saw his art documentaries before making The Mystery of Picasso. and rewatched some older ones in shiny new copies. Forgot how amazing this one is. Songs and animation and opera, owl-led advertisements and imaginary newsreels. Mostly shots of the factory, with few humans. Forgot about the rhyming voiceover. From Marker’s intro: “Each evening, in the centre of New York, an artificial day rises. Its purpose is to announce spectacles, sell products, and the producers of these adverts would be amazed to know that the most fascinating spectacle, the most precious product made by them, is the very street transformed by their signs.” Klein shoots the lights of Broadway, scored by cartoon-jazz music that matches the editing and light movement. Wonderful, would like to put this and some Joris Ivens and Bert Haanstra shorts on an infinite loop in my office. Klein’s first film (I only knew his Mr. Freedom before), edited by Alain Resnais. Uses the sort of electronically-processed sound he’d be featuring in his next full-length film, Sans Soleil. On a day when everyone is looking at a solar eclipse through special glasses, Marker watches the watchers instead. First half has live sound at a hippo sculpture park, then he switches to slow motion and electronic music and goes elsewhere (the zoo? there are owls). I didn’t rewatch my terrible-quality copy of Marker’s Description of a Struggle, but instead tried this doc, the second feature-length film I’ve seen this year made in response to a Chris Marker-related film. Geva shows the Marker film and stills to locals, asks about the people who appeared in the original. Reminds me of Marker’s friend Agnes Varda, her periodic returns to previous films through documentaries and shorts and DVD extras. Geva is investigating images and memories a la Marker and Varda, turning out a worthy follow-up to the original feature. Of the happy kid riding a cart down a hilly street: “British policeman bashed his head with an iron rod. Gone a bit mad since. Far From Vietnam is out in HD. The Confession is also out, and includes the Arthur London short. Mémoires pour Simone still lacks subtitles, as do most of the 1969-1970 shorts. Oh, and it looks like new copies of Description of a Struggle and Blue Helmet just came out – will save those for another day. A slow-unfolding (but always formally exciting) Resnais movie gathering most of his favorite actors in a room for a contrived reason (a just-deceased writer/director wants his favorite actors to evaluate film of a modern performance of his Orpheus/Eurydice play). As the film goes on, the actors in the audience interact with it, reciting lines to the screen and to each other, standing up to perform entire scenes. The movie has a crisp, digital look and Resnais makes walls fall away smoothly, transporting the actors seamlessly into scenes from the play, using split-screens to show simultaneous performances of the same scene. It often seems like the ultimate movie of theater and performance, the work he’s been leading towards at least since the early 80’s (if not earlier, the location-jumping and memory-morphing hearkening back to his famed earliest features). Fortunately, it seems he’s still going strong and will have another movie out next year. In the crowd: the Smoking/No Smoking team of Sabine Azeme and Pierre Artiti, Mathieu Amalric and Anne Consigny from Wild Grass, Michel Piccoli and Gerard Lartigau from way back in The War Is Over, Lambert Wilson (Not on the Lips), Anny Duperey (Stavisky), and more (can’t expect to know ’em all on a first viewing). Actor Denis Podalyes plays the director, who addresses the group by video at the beginning and appears in person at the end, and his brother Bruno Podalyes actually directed the video within the movie. The reference point in the Resnais canon is 1986’s Mélo, which similarly foregrounded and made a virtue of its theatrical source while doubling and tripling the layers of irony, though nowhere near the extreme degree that the director pursues in his latest. .. Resnais suggests that the proper relation between the cinema and the theater is to throw it all together, take the best of both worlds and present it as pure showmanship. A collective hallucination of people who think they’re talking to each other but are only talking to a screen: it’s the duly-noted theme of Vous n’avez encore rien vu, as the backgrounds dissolve from the screening room into a train station, café, and hotel, while the characters remain seated in place, stuck in some cinematheque of their imagination, foreshortened by Ruizian compositions a plane apart from their own space. Since I’ve watched nearly all of Alain Resnais’s movies, and loved nearly all the ones I’ve watched, I had the completist urge to watch his hour-long entry in a series of TV episodes about creative types: Kafka, Vivaldi, Einstein among others in an optimistically-titled, short-lived series called The Audio-Visual Encyclopedia. Didn’t expect much, but it’s pretty remarkable. Opens with a player piano, seen but not heard, then people talking about Gershwin in different languages, unsubbed. The film’s writer Edward Jablonski is on screen talking about Gershwin when a narrator starts talking over him. Photos fade in and out, people vanish like in Not on the Lips. Resnais makes much of Gershwin’s erratic behavior shortly before dying of a brain tumor, uses this to justify interruptions and strangeness in the movie. And Resnais’s recent interest in graphics – see (or preferably don’t see) his comic-book movie I Want To Go Home – comes alive with illustrations.